William Branham prophecied that the Vatican City and Rome would be destroyed by Communism in a swift military campaign. He later changed his doctrine to say that Romanism would rule the world, not Communism. The problem with this prophecy is that the Roman Catholic Church was actually instrumental in the destruction of Communism. 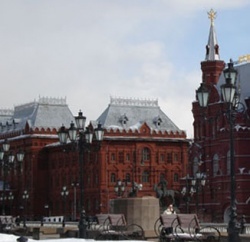 The government of Russia no longer has a major problem with the Vatican as the opposition to Christianity has largely disappeared, along with Communism. Question: You have said many times that communism was raised up by God to serve His purpose, as King Nebuchadnezzar. Now where did the--communism fit into the picture that will--it finally--will finally do? How does it wind up? Many scholars believe that in the kingdom of the north, Gog and Magog mentioned in the Scriptures, goes down against Israel in the--in the... (I can't make out just what that is. Yeah. Yeah.) I believe of the--some of the tapes taken, said you said it would finally drop--that--that communism would finally destroy Catholicism or the Vatican by an explosion. Is this right? I'll prove to you that communism is working straight in the hands of Almighty God to destroy the Roman...And remember, I say this as God's prophet: The Russian empire will drop an atomic bomb of some sort on the Vatican City and destroy it in one hour. THUS SAITH THE LORD. This page was last edited on 22 August 2015, at 03:55.